My novel, Are You Sleeping, centers around a podcast called “Reconsidered” that is reinvestigating the long-closed murder case of a man named Chuck Buhrman. Someone has been convicted of Chuck’s murder and sentenced to life in prison … but Poppy Parnell, the host of “Reconsidered,” is raising questions about whether that person is really responsible. “Reconsidered” is an instant smash hit, and millions download the episodes each week. That being said, it’s probably no surprise that I love true crime podcasts! I’ve gathered up five of my favorite true crime podcasts to share with you below. Don’t worry—while “Reconsidered” runs a on the tabloid side and Poppy Parnell can be a bit of a scandalmonger, none of the podcast listed below share those qualities! “Serial” is the podcast that started it all for me. I didn’t even think that I liked podcasts until my brother introduced me to “Serial” during its first season, and then I was hooked before the first episode was even finished. In that first season, host Sarah Koenig took another look at the 1999 murder of Baltimore high school student Hae Min Lee and the subsequent conviction of her fellow classmate and former boyfriend Adnan Syed for her murder. The case is far from clear, and Syed maintains his innocence to this day. “Serial” is a high-quality, compelling podcast that is pretty much required listening in the true crime genre. Revisit it now while Adnan Syed awaits the decision on his June hearing, where his lawyers argued he should get a new trial. “Serial” may have played a role in getting Adnan Syed the possibility of a new trial, but “Up and Vanished” may have actually helped solve a murder. Documentary filmmaker Payne Lindsey digs into the 2005 disappearance of 30-year-old former beauty queen Tara Grinstead from Ocilla, Georgia. The disappearance is cursed with a dearth of clues, and the case was considered cold when Lindsey started his podcast in 2016. Then, earlier this year, the Georgia Bureau of Investigation announced they had a received a tip, and two men were subsequently arrested in connection with Tara’s death. One man has been indicted and entered a plea of not guilty; the other is awaiting a court date. Is “Up and Vanished” responsible for renewing public interest in the cold case, and therefore leading to the tip? It very well may be. Either way, the podcast is compulsive listening. Start from the beginning to hear the story unfold. While “Serial,” “Up and Vanished,” and “Missing Maura Murray” each do a deep dive into one case, “The Generation Why Podcast” features a new case in each episode. Hosts Aaron and Justin have been producing episodes for five years, and they have tackled almost every topic you can imagine. Search the extensive archives to find episodes on high-profile cases like Jon Benet Ramsey (episode 129), historical cases like H.H. Holmes (episode 164), more recent cases like Brandon Lawson, who vanished mysteriously from Texas in 2013 (episode 193), and a variety of pop culture favorites like the Amityville House (episode 45), Steven Avery of Making a Murderer notoriety (episode 166), and the Mothman (episode 209). Interested in Adnan Syed or Maura Murray, but don’t want to commit to an entire series? Syed is included in episodes 191 and 195, while Maura is featured in episode 54. The bite-sized format makes this podcast perfect for when you want a contained dose of mystery. Kathleen Barber is the author of Are You Sleeping. Follow Katie on Twitter and Instagram @katelizabee. 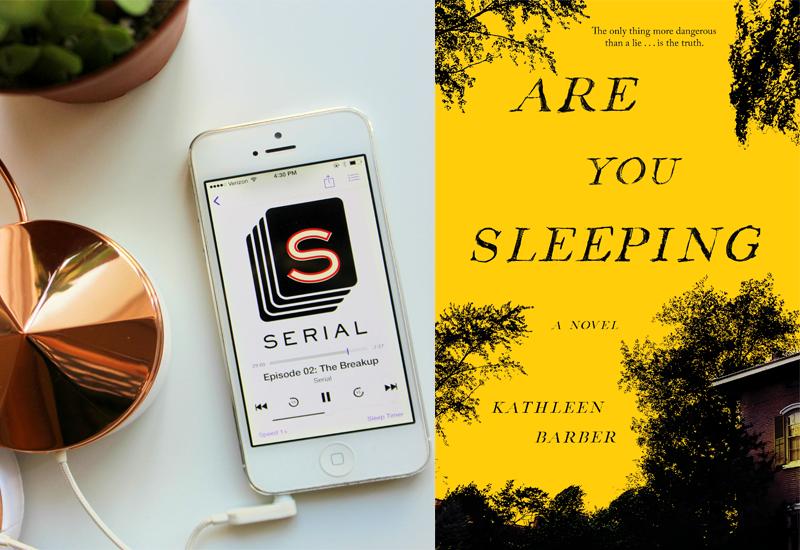 Kathleen Barber is the author of ARE YOU SLEEPING. Follow her on Twitter or Instagram at @katelizabee or visit her at kathleenbarber.com.